Despite the golden years without the gold, you can’t deny us oldtimers our treasure of precious memories. 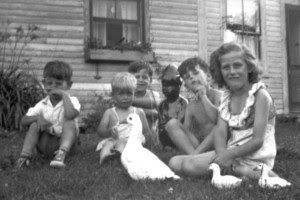 This 1953 photo with a few of my siblings on my grandparents’ lawn reminds me of a point later in life, and capturing the nostalgia of lawn ducks. Living in the small town of Derby, Maine, you had to go to the big city like Milo or Dover to find high quality lawn decorations. Look closely at the fisherman (3rd from the right), and you can see the fishing rod, string, and wooden fish dangling off the end. Without a paint job, that piece would be politically incorrect in most parts of the country nowadays except on EBay or Antiques Road Show. In the 1950’s the fisherman and those painted lawn ducks left us little kids in awe. Some of us didn’t get over it. Years later I discovered people still make cement lawn ducks, and my wife and I purchased a set 5-10 years ago including the momma and 4 ducklings. After a two color paint job the resemblance to the childhood memory was irresistible, and I believe the realism explains the attraction. To my utter surprise passersby, maybe tourists, would come to a screechin’ halt to admire the ducks. Some, too impatient to wait for them to move, jumped out and snapped photographs. That never did happen in Derby, yet after a casual comment to a neighbor about the daily attraction, the next day we awoke to see a cardboard sign erected on a stick next to the ducks: “Duck Postcards 50 Cents”.